There is a reason why marketers spend so much time trying to find out the right way to promote businesses online. Due to rising generations of more tech savvy internet users, digital marketers have had to be even more careful – and find more inventive marketing methods that are both successful and natural. One of the most popular ways of achieving PR success, according to a recent study, is through ongoing ambassadorships. When we mention ongoing ambassadorships, we mean the process of creating a long-term relationship with an influencer of your business. This relationship can be especially rewarding, because not only does it offer you the opportunity to reach your influencer’s personal audience, but it also opens up a wealth of marketing opportunities – including content marketing, social campaigns, competitions, etc. The list goes on and on. 70.6% of marketers said that they believed that ongoing ambassadorships were an effective form of digital marketing, ranking this in front of product reviews (66.7%) and brand mentions (53.9%). Despite this popularity, marketers also confessed that whilst over 80% of them used sponsored coverage (which only 50% rated as effective), only 52.5% had pursued brand ambassadors. Last year we announced our ongoing partnership with Runway Training, in order to deliver apprenticeship programmes. This connection, and the way that we are using our partnership to create something which ties the two of us organically together, demonstrates some of the great value that brand partnerships can have. From an external perspective of someone who maybe new to both brands, it is easy to see the potential. Not only is the move making use of both followings, but the connection between the two is natural – and therein lies its main value. Companies can still raise awareness, create back links and produce influencer content, but through the ongoing relationship, this comes across as much more real. One of the major problems for digital marketers is having to create elaborate marketing plans which offer a good ROI, as well as continuing to push their referrals and sales and social followings, whilst also seeming human. It’s a lot to ask, and for many, this just does not compute. Instead of reaching out to brands and influencers as a way to achieve a quick link, marketers should instead be looking to make relationships with the people in their field as friends and colleagues. Instead of starting a conversation with an influencer with a link in mind, try a more open, friendly approach. If you keep that communication going long enough, there’s a good chance you’ll be able to work out a way of working together which offers you so much more than a single link ever would. Think of it like comparing a one night stand and a relationship. A one night stand offers you very short term pleasure with (potentially) lots of people, but a relationship means that you can get more long term affection, ask for favours and sometimes go out in public together holding hands. If you’re into that sort of thing. With Valentine’s Day just behind us, why not use this year to focus on making reaching out to your investors and enjoying the joyful ups and downs that comes with a brand ambassador opportunity? We would love to know your thoughts about this article, so why not drop us a comment or leave a message on our Facebook or Twitter. Want to talk to us about being our friend, or working with us? 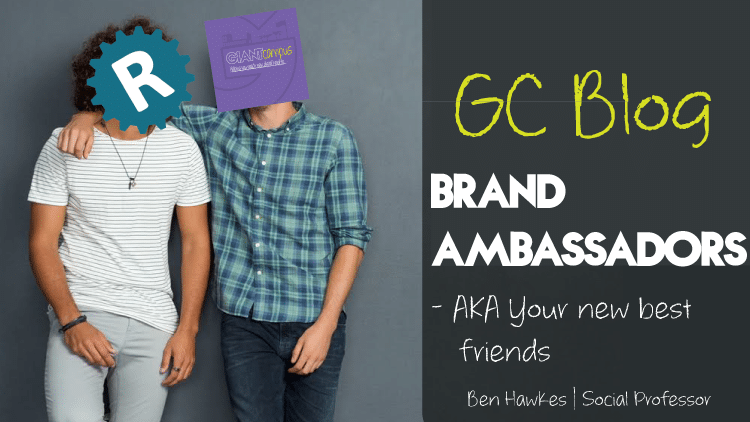 Drop us an email at hello@giantcampus.co.uk.